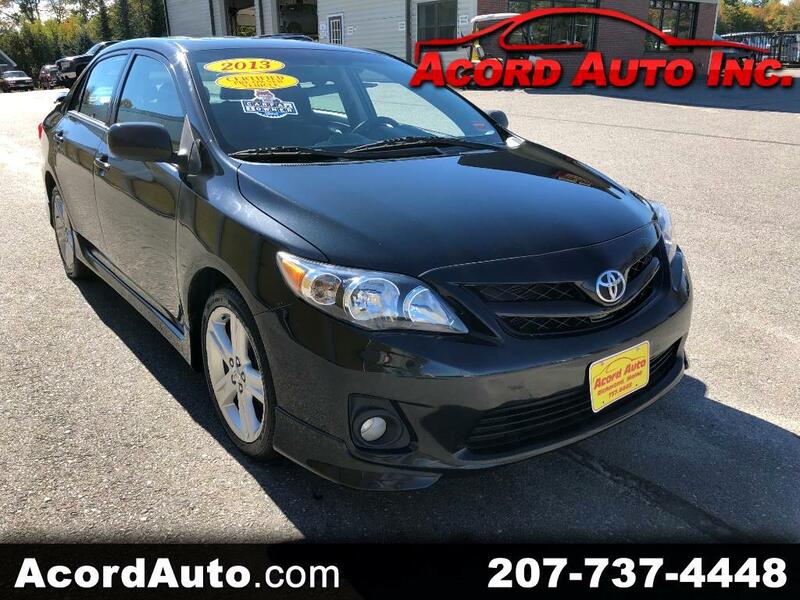 Used 2013 Toyota Corolla S 4-Speed AT for Sale in Richmond ME 04357 Acord Auto Inc.
Toyota is known for reliability throughout the years and with only 60k miles on the clock this little car is sure to last a long time to come. Fuel mileage is sure to please coming in at an estimated 34MPG's highway which means not only is the car cheap to own and maintain but also drive! so head on down and take this Sporty little corolla for a drive and fall in love!!! A CarFax is provided Free of charge on Every Vehicle! It provides you peace of mind with detailing information related to the past owner and service records. Our Sales team is available to answer any questions that you may have. Stop in and take a test drive! Call 207-737-4448 to schedule a time to come in or ask any questions! Vehicles come fully serviced and inspected- With a 14 day plate / full warranty. We are conveniently located 1 mile off exit 43 off I 295- 15 min from Augusta / Topsham and 35 min from Portland. Acord Auto is a family owned dealership that thrives on building lifetime relationships with customers. We aim to make your car buying experience easy, fun and pressure free. Visit Acord Auto Inc. online at www.acordauto.com to see more pictures of this vehicle or call us at 207-737-4448 today to schedule your test drive. Message: Thought you might be interested in this 2013 Toyota Corolla.